Chico Municipal Airport is a public airport located 6 km north of the central business district of Chico, a city in Butte County, California. The airport covers 1,475 acres and has two runways, the main of 6,722 feet long, a secondary one with 3,000 feet long and one helipad. It was established in 1935 when the City of Chico acquired approximately 160 acres of land 8 km north of what was then the City limits and constructed an airport hangar and runway. Until 1941, this original facility was leased to a fixed-base operator. During 1941 the City acquired an additional 1,000 acres for the purpose of leasing the Airport to the United States Government to establish there an Army Air Forces Basic Training Air Field. Named as Chico Army Airfield the new base become a major training site for thousands of pilots, both as a primary training base flying BT-13s planes, and for advanced gunnery and multi-engine training using P-38, P-39, P-63, B-17, B-29s planes. After the war, the local authorities negotiated an agreement by which the airport property was returned to the City, together with the bulk of improvements which had been constructed by the Army. In September 1961, Air Force Cambridge Research Laboratory (AFCRL), an institution with headquarters in Bedford, Massachusetts which managed all the balloon projects for the Air Force, occupied a new, rented balloon-launching facility at the Chico Municipal Airport. The first balloon launched there on October 24 was quite a success, crossing the country from west to east and being terminated 51 hours later in the Atlantic Ocean, 200 miles east of Boston. The operations took place mainly in the winter months, when the prevailing winds forced the balloons to follow eastward flight paths. Nevertheless, there are also records of some flights that stretched over the Pacific Ocean off the coast, especially when them transported experiments involving the ejection of heavy loads (testing of new types of parachutes, measurements of flight dynamics, etc.). 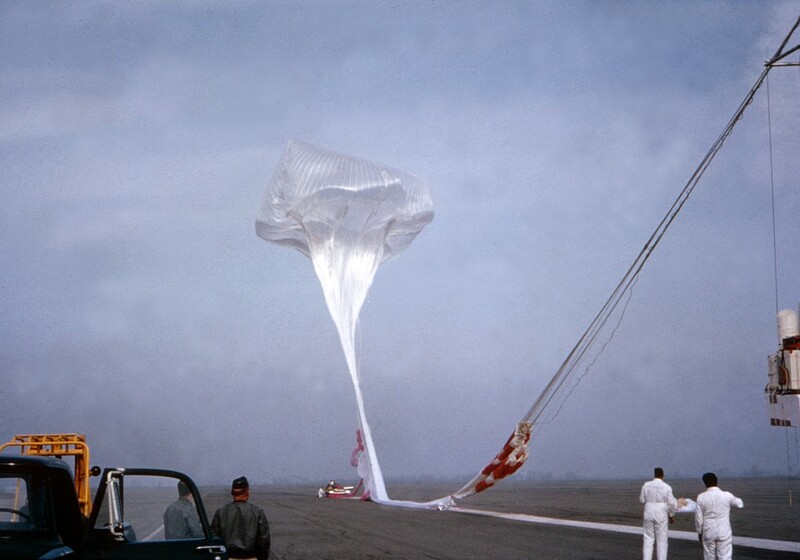 In October 1972, AFCRL launched from Chico a 47.8 million cubic foot, single-cell balloon. The balloon was manufactured by Winzen Research Inc. using extremely thin polyethilene film and was protected by a self-opening reefing sleeve. After a nominal ascent phase it managed to reach a height of 170.000 ft. establishing a new altitude record for an unmanned aerostat, that would endure unbeaten for 30 years until 2002. The amount of flights started to decrease during the rest of the 70's and the first years of the next decade, until April 1st 1983, when the Air Force Geophysics Laboratory (new denomination of the former AFCRL) finished the agreement to rent the facilities and shutdown the launch station. 3/12/1966 1 h 10 m HYPSOMETER CONTROLLED BALLAST SYSTEM TEST Failure of the balloon at 44.000 ft.